Here at JMRT, a horse transport hire company, our aim is to get your horse safely and securely in a stress free manner to a destination of your choice. Whether you're looking to transport the family pony to the vets or a local show, or your million pound show/racehorse, then, as an established horse transportation company, we can promise to do it for you. Distance is no object, local or national, we can cater for all in one of our Lambourn Oakley Super Six Boxes. We can also offer international horse transport. To this end, all our drivers are renowned horse owners themselves, having competed and won at both County and National level. 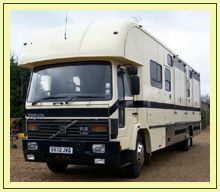 Our drivers have a wide range of horse related experience, ranging from working in equine veterinary practices; racing yards; hunting yards; Newmarket studs; handling on a daily basis stallions, mares and foals, and gaining experience in equine transport for this company whilst driving for other Newmarket Racehorse Transporters. We sell the new horse LOCATA system. Click here for more details.